The law determines not only the responsible authorities, aims and objectives of maritime spatial plans and the issues it/they should regulate but also describes key procedures of preparation of the plan and its consultation with focus on public participation. Detailed provisions concern also adoption of the plan and its periodical evaluation. What do Member States have to do to implement the Directive? There is no uniform approach to the legal foundations of MSP. The MSP Directive establishing a framework for maritime spatial planning does not require specific pieces of new law on MSP to be adopted by the Member States. To the contrary, the Directive suggests that MSP can be implemented on a variety of legal bases, i.e. Member States „may include or build on existing national policies, regulations or mechanisms that have been or are being established before the entry into force of this Directive, provided they are in conformity with the requirements of this Directive” (DIRECTIVE 2014/89/EU). The approach of European countries varies with regard to the type of law backing MSP. For instance in Norway maritime plans were prepared without a legal basis. In Norway MSP is anchored in government reports to the parliament and in government declarations. In this country each sector (in particular shipping, fisheries and aquaculture, petroleum and energy) is managed separately through specific legislations and dedicated ministries. However, joint will of co-operating ministries and other involved stakeholders was sufficient to prepare the plans, and such plans (formally non-binding) resulted in moving Traffic Separation Schemes off the coast of Norway which solution was accepted by the International Maritime Organisation. In Germany or in Lithuania MSP was based on existing pieces of law related to terrestrial spatial planning which were slightly amended. In Germany the national legal base is given by the general Spatial Planning Act („Raumordnungsgesetz“ / ROG), which was made applicable to the EEZ in 2004. MSP in Lithuania is included into the national legislation regulating spatial planning – the Law on Territorial Planning and its secondary legal acts. The revised Law on Territorial Planning was adopted on 27 June 2013. A different situation is in the neighbouring Latvia, which developed special MSP legislation. Regulation of the Cabinet of the Ministers No. 740 on Development, Implementation and Monitoring of Maritime Spatial Plan has been approved by the Latvian Government in 2012. The Regulation defines the content, elaboration procedure as well as implementation and monitoring procedures of MSP. Similar approach was taken by UK. 4) Proper consideration of land-sea interactions. The adding of the axiological part to the Polish MSP law and explaining the essence of the ecosystem approach was partly based on experience gained through MSP pilot plans (link here), but mainly it should be directly attributed to the EU Directive requirements. In the Directive basic principles and goals of MSP are underlined and therefore a relevant cross-reference in national law is helpful. The role of maritime spatial plans was described in the earliest MSP articles of 2003. This has not been changed too much afterwards. Some new areas to be covered by MSP have been only added such as fishery, aquaculture, offshore renewable energy and exploration and extraction of minerals. Comparison of the stipulations regulating the role of MSP in the Acts of 2003 and 2015 is provided in Table 2. This part of the law was always considered important, necessary and sufficiently detailed. Additions should be seen rather as a result of MSP pilot plans executed in Poland than a direct influence of the MSP Directive. areas and conditions for protection of environment and cultural heritage. In the current law all these were kept intact with one important change. Polish sea areas are managed by the Minister responsible for matters of maritime economy, who, in the name of the State, acts as the owner of all Polish sea areas. Thus the minister responsible for terrestrial spatial planning has only a supportive role in MSP. Consequently, maritime spatial plan(s) are adopted by ministerial order of the minister responsible for maritime economy who should act in co-operation with the minister responsible for regional development, and in consultation with the ministers in charge of agriculture, culture and national heritage, the environment, fisheries, internal affairs, transport, water management, and the Minister of National Defence. All these changes were introduced due to Polish specific reasons and are not related to the Directive. Perhaps only the addition of the minister responsible for cultural heritage as a co-operating partner in adopting maritime spatial plans can be attributed partially to the influence of the Directive. ways of use of sea areas, including restrictions and admissions. Port authorities of ports of basic importance to national economy with respect to plan solutions which may influence the development of the ports. Also a list of bodies which should issue opinion on the draft maritime spatial plan was added in the amendment of 2015. Issuing the opinion is therefore compulsory for these entities. Comparison of the stipulations regulating the role of MSP with regard to sea-land relations in the Act of 2003 and 2015 is provided in Table 3. This part of law was amended mainly in result of experience acquired by the Polish Maritime Administration in the course of pilot plans and co-management of the coastal strip, but inspiration was also taken from the EU Directive which requires that MSP ”should take into account land-sea interactions”. The provisions of the Law of 2003 were not changed, but new stipulations were added. “a) the Regional Conservator of historical heritage - competent for areas covered by historical heritage protection and areas proposed to be covered by such protection. 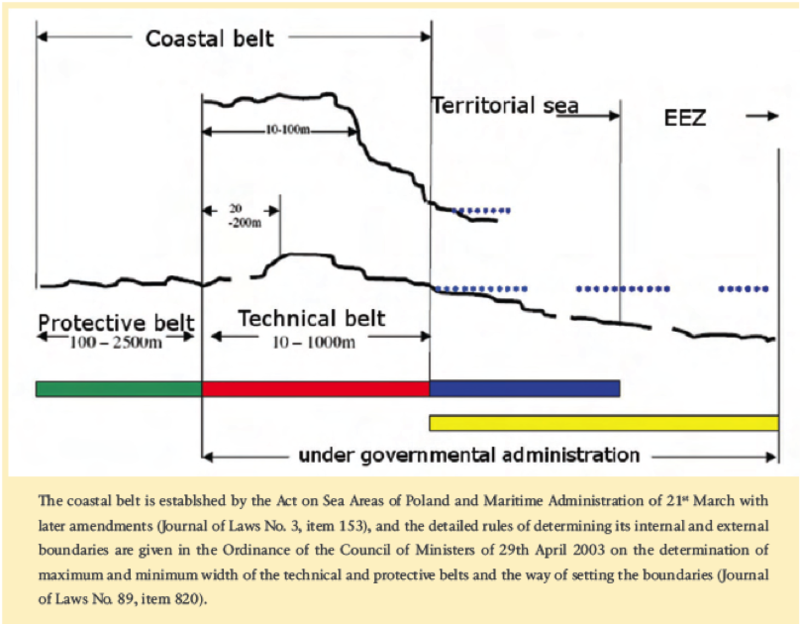 Figure 1 presents the management regime of the land-sea interface in Poland. the need for the Minister responsible for matters of construction, spatial management and housing to issue a Regulation setting out the required scope of the textual and graphic parts of the maritime spatial plans for internal sea waters, territorial sea and EEZ, with particular attention given to requirements as regarding planning materials, types of cartographic materials, applied designations, terminology, standards and ways of documenting the planning works. These provisions were kept in the new amendment of 2015 with some changes. The Regulation setting out the required scope for the textual and graphic parts of the maritime spatial development plans, etc... should, under the changed law, be issued by the Minister responsible for matters of maritime economy and should respect appropriate BSR and EU guidelines. For inducing these changes the impact of the Directive was important. However the law of 2003 did not described the process of elaboration of the maritime spatial plans The procedures for the preparation, monitoring, assessment and updating the plans were left to the discretionary power of the Maritime Administration. This was perhaps one of the main reasons for the delay of actual preparation of formal maritime spatial plans in Poland. Therefore, in the amended law these questions were comprehensively addressed. This also served to fulfil the requirements of the EU Directive concerning public participation, involvement of stakeholders and trans-boundary cooperation. Comparison of the stipulations regulating the procedural aspect of preparation of maritime spatial plans in the Act of 2003 and 2015 is provided in Table 4. 17) submits the draft plan, together with the list referred to in point 12, and draft project summary related to the SEA procedure/.../to the minister responsible for matters of maritime economy for its adoption /.../. The minister responsible for matters of maritime economy is responsible for organizing cross-border cooperation in the field of spatial planning and development of Polish internal sea waters, territorial sea and EEZ. The Council of Ministers may define, by regulation, the required scope and manner of cross-border consultations on maritime spatial plan, taking into account especially the recommendations concerning MSP adopted by the Helsinki Commission for the Protection of the Marine Environment of the Baltic Sea (HELCOM) and the relevant European Union entities/bodies/organs. The minister responsible for matters of maritime economy and the minister responsible for regional development in consultation with the minister responsible for fisheries and the minister responsible for the environment shall determine, by regulation, the required scope of the maritime spatial plans, in their textual and graphic parts to be drawn up also in the form of databases, specifying in particular the requirements for planning materials, the type of cartographic elaborations, scale of cartographic elaborations, used designations, terminology, standards and ways of documenting the planning work, with a view to clarity and transparency of plans and respecting guidelines adopted by the Commission for the Protection of the Marine Environment of the Baltic Sea and the bodies of the European Union in the field of maritime spatial planning. In its practical work Maritime Administration in Poland goes beyond the minimum legal requirements and for instance starts transboundary consultations at a very early stage of draft plan preparation inviting representatives of authorities responsible for planning and management of sea areas from Baltic Sea coastal states to a first information and discussion meeting soon after the start of the Polish MSP process. The law of 2003 did not describe the process of monitoring and assessing maritime spatial plans. The provisions regulating this issue were added in 2015. Now the Polish law on MSP stipulates that maritime spatial plans should be periodically evaluated at least every 10 years. Moreover the law gives detailed instruction who should do such an evaluation, in what format the results should be presented and in which case they should lead to the revision of the plan. This was added to fulfil the requirements of the Directive. Comparison of the stipulations regulating the assessment of maritime spatial plans in the Act of 2003 and 2015 is provided in Table 5. 1. The plan is periodically evaluated at least once every 10 years. 4. On the basis of the report referred to in paragraph. 3, the minister responsible for matters of maritime economy, shall decide on amending the plan and on the scope of the necessary changes. Polish case of development of MSP laws show some features worth to be highlighted. Gradual development allowed to make the changes and addition on the basis of growing and accumulated experience acquired in the framework of pilot plans. Thus Polish law is simple, handy and not overregulated, and is in line with the MSP Directive. Polish MSP law pays also attention to land-sea linkages and seeks for balance between environmental and economic concerns. However, there are still some weakness. Another problem is the still insufficient stakeholder integration into MSP According to Polish law on MSP each stakeholder has a right to express an opinion in writing and the bodies preparing the plan should explain how they handle that opinion. However the problems are related to limited stakeholder capacity and balance of powers between stakeholders. Since, this issue can benefit from legal solutions only to limited extent the networking and capacity building actions seem more promising. There are also some problems with data sharing. Polish law on MSP stipulates that the minister responsible for matters of maritime economy is responsible for organizing the exchange of cross-border spatial data needed in the maritime spatial planning. Also at national level when preparing a stocktaking report the minister organised a process of collecting all MSP relevant data, data sharing and data adjustment to the needs of MSP. However it was a onetime process. More systematic approach to that is still welcome. New regulation concerning information sharing are required at large. Finally Polish law on MSP did not ask directly to plan sea space sparingly. Therefore it does not provide a direct incentive for multiple use. However, this can be done even without a legal obligation as good planning practice. Naming all these problems and shortcomings one should admit that the existing legal base seems anyway more than sufficient for elaboration of maritime spatial plans. This practice is applicable in any country in which MSP should be conducted.